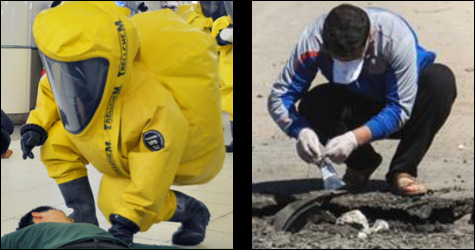 Note: experts say the person or other "evidence gatherers" like him (on the right), would all be dead if they had come into contact with real military-grade Sarin - without the proper protective gear - which indeed they lacked. Lost in the hyper-politicized hullabaloo surrounding the Nunes Memorandum [...] was the striking statement by Secretary of Defense James Mattis that the U.S. has “no evidence" that the Syrian government used the banned nerve agent Sarin against its own people. at Syria on April, 2017, which killed approximately 17 human beings (Syrians). Chemical weapons are abhorrent and illegal, and no one knows this more than Carla Del Ponte. She, however, was unable to fulfill her U.N. Joint Investigative Mechanism mandate in Syria and withdrew in protest over the United States refusing to fully investigate allegations of chemical weapons use by "rebels" (jihadis) allied with the American effort to oust President Assad (including the use of Sarin by anti-Assad rebels). Donald Trump's Sept 2013 Tweet directed to Pres. Obama - wisely telling him to not start a war in Syria. Trump's campaign promise of stopping the US's costly on all levels, "endless wars" / "regime change" policies of the D.C. establishment, was a key factor in gaining him his historic upset victory in the 2016 election. 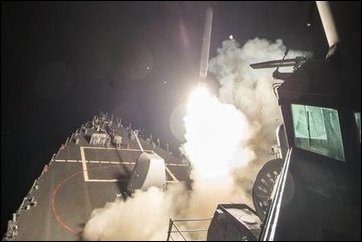 Breaking News: US Planes and Warships Bomb Syria - April 13, 2018. May Our Lady protect all innocent souls in whatever country they reside.